As a common injury occurring in athletes,  hamstring strains are a result of eccentric muscle contraction with the hip flexed and the knee extended. In athletes, this is often manifested during non-contact activities such as sprinting or ballistic movements. Acute strains most often occur at the myotendinous junction. Together, the hamstring tendons contribute to flexion of the knee and extension of the hip. Beyond this, they contribute to the rotatory stability of the knee: the semimembranosus and semitendinosus medially rotate the tibia at the knee and the biceps femoris contributes to lateral tibial rotation at the knee. Injuries to the hamstring muscle group can range in severity from muscle damage with preservation of surrounding fascia to complete muscle tears, resulting in loss of structural integrity of the tendon. Similarly, treatment can range from non-operative management with non-steroidal anti-inflammatory drugs, rest, and gradual return to activity to surgical intervention and anatomic restoration of the hamstring footprints on the ischial tuberosity. Non-operative treatment of proximal hamstring injuries is generally appropriate for single tendon avulsions and tolerance of distal retraction up to 2 cm. Even in athletes, these injuries allow return to elite activity in approximately 6 weeks. Patients with more serious injuries, such as those with 3-tendon rupture and retraction more than 2 cm, may be better suited to surgical intervention, taking into consideration patient age, activity, and tolerance of postoperative restrictions. In our opinion, physiologically younger and active patients with retraction of multiple tendons beyond 2 cm should be treated with surgical repair. A 56-year-old male security officer and avid recreational ice hockey player presented with a 1-week history of pain in his left posterior thigh. The pain began after he slipped and his left leg extended into a split position. He felt a “pop” and experienced isolated pain to the posterior aspect of his left thigh and significant ecchymosis. He denied any previous injury to his left lower extremity, nor did he have any history of lower extremity surgery. Since his injury, he had been unable to return to work and had experienced pain with sitting. He denied numbness and tingling. The patient was diagnosed with a full-thickness proximal hamstring rupture with significant retraction, as shown in Figures 1-3. Figure 1. Axial MRI demonstrating proximal hamstring rupture and accompanying hematoma collection. Axial imaging can help appreciate possible sciatic nerve compression. Figure 2. 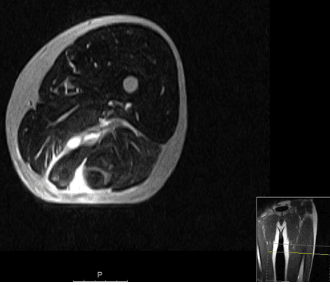 Sagittal MRI demonstrating distal retraction of hamstrings tendon. Figure 3. 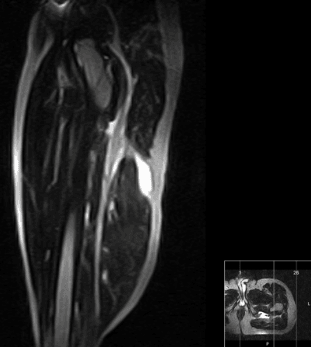 Coronal MRI demonstrating proximal hamstring rupture with distal retraction. We had a long discussion with the patient regarding surgical versus non-surgical treatment for his injury. Surgery and the associated risks, such as injury to the sciatic nerve and possible wound complications, were clearly described, as was the postoperative course, including a brace and crutch use for 6 weeks. The patient understood that it would likely take 6 months before he could return to full duty at work. He verbalized understanding of the risks and postoperative course, and the decision was made to proceed with surgical repair. The patient was placed in the prone position with appropriate padding of all bony prominences. A transverse incision, which allows for better cosmesis and extension, was made in the gluteal crease, directly inferior to the ischial tuberosity. The incision was carried down through the subcutaneous fat to the level of the gluteal fascia, taking care to avoid injury to the posterior femoral cutaneous nerve. A transverse incision was made through the gluteal fascia and the gluteus maximus muscle was identified. The gluteus maximus was elevated and retracted superiorly, with consequent exposure of the underlying hamstring fascia. A longitudinal incision was made in the hamstring fascia to allow identification of hamstring tendons. Note that scar tissue may erroneously make it seem that the tendons are intact. The layer of scar tissue was incised, a large amount of hematoma was expressed, and the ruptured tendons was identified. The sciatic nerve was then identified and retracted laterally. A neurolysis should be considered in patients with chronic injury due to sciatic nerve scarring. Scar tissue adherent to the hamstring tendons was removed and the tendon edges were debrided until normal tissue was encountered. The tendons were then tagged with a heavy suture. A periosteal elevator or curette was used to abrade the lateral aspect of the ischial tuberosity. Suture anchors were used to repair the tendons to bone, with careful attention placed on the restoration of anatomic footprints of the hamstring tendons: The semimembranosus tendon is placed most laterally and the semitendinosus and biceps confluent tendon are relatively medial. Sutures from the anchors were then passed through the tendons using horizontal mattress configurations and tensioned with the knee flexed at 30°. The wound was copiously irrigated and closed in layers. The leg was placed in a custom orthosis that resists hip flexion from 30° to 40°. Isokinetic evaluation at 12 weeks, with the knee at 60°, 120°, and 180° of flexion; results compared with the contralateral leg. Proximal hamstring strains are a common cause of pain and dysfunction in active patients. The treatment of these injuries can range from non-operative management to surgical repair. Beyond the severity of injury, careful consideration should be given to patient age, activity, and ability to comply with postoperative rehabilitation prior to deciding on the optimal treatment. A systematic review demonstrated significant improvement with operative treatment of proximal hamstring ruptures compared with non-operative treatment with regard to strength testing and return to sport. A recent systematic review also demonstrated subjective improvements in patient satisfaction with surgical repair, despite persistent decreases in strength and residual pain. These findings were echoed in a recent meta-analysis that compared outcomes of operative versus non-operative treatment, reporting higher patient satisfaction, hamstring strength, and less pain with surgery. However, it is important to note that many of the studies included in the aforementioned analyses suffered from small populations of patients treated non-operatively. Differences in outcome between operative and non-operative treatment have also been identified in chronic proximal hamstring ruptures. A case series of 52 patients who underwent proximal hamstring repairs, 12 of whom had chronic injuries, showed an overall satisfaction of 98% after surgery. Furthermore, no significant differences were found in Lower Extremity Functional Scale scores or Marx Activity Scale scores between repairs of acute versus chronic injuries. These results highlight a positive outcome with surgical treatment, despite the chronicity of injury. When indicated, proximal hamstring injuries can be effectively treated surgically, resulting in an improvement in strength and patient satisfaction. For the active patient, this treatment can offer a successful return to activity. Anant Dixit, MD, is a sports medicine fellow at The Rothman Institute, Philadelphia, Pennsylvania. Steven B. Cohen, MD, is a board-certified orthopaedic surgeon specializing in sports medicine at The Rothman Institute, Philadelphia, Pennsylvania. Clanton TO, Coupe KJ. Hamstring strains in athletes: Diagnosis and treatment. Journal of American Academy of Orthopaedic Surgery 1998; 6: 237-248. Garrett WE Jr. Muscle strain injuries. Am J Sports Med 1996; 24 (6 suppl): S2-S8. Ali K, Leland JM. Hamstring strains and tears in the athlete. Clin Sports Med. 2012; 31(2): 263-272. Cohen SB, Bradley J. Acute proximal hamstring rupture. Department of Orthopaedic Surgery Faculty Papers. 2007; Paper 12. Ahmad CS, Redler LH., Ciccotti MG., Maffulli N., Longo UG., Bradley JP. Evaluation and management of hamstring injuries. Am J Sports Med. 2013; 4(12): 2933-47. Birmingham P, Muller M., Wickiewicz T., Cavanaugh J., Rodeo S., Warren R. Functional outcome after repair of proximal hamstring avulsions. J Bone Joint Surg Am. 2011; 93(19):1819-26. Brucker PU, Imhoff AM. Functional assessment after acute and chronic complete ruptures of the proximal hamstring tendons. Knee Surg Sports Traumatol Arthrosc. 2005; 12(5): 411–418. Harris JD, Griesser MJ., Best TM., Ellis TJ. Treatment of proximal hamstring ruptures–a systematic review. Int J Sports Med. 2011; 32(7): 490-495.
van der Made AD, Reurink G., Gouttebarge V., Tol JL., Kerkhoffs GM. Outcome after surgical repair of proximal hamstring avulsions: a systematic review. Am J Sports Med. 2015; 43(11): 2841-51. Bodendorfer, BM, Curley AJ, Kotler JA, et al. Outcomes after operative and nonoperative treatment of proximal hamstring avulsions: a systematic review and meta-analysis. Am J Sports Med. 2018; 46(11): 2798-2808. Cohen SB, Rangavajjula A, Vyas D, Bradley JP. Functional results and outcomes after repair of proximal hamstring avulsions. Am J Sports Med. 2012; 40(9): 2092-2098.